When you bring your vehicle in to have dents or scratches removed, we do a thorough examination to identify and record each blemish on the exterior. Each blemish is marked for our records in order to provide you and your insurance company the most comprehensive information to base your repair decision on. What Types of Blemishes Do We Repair and How Do Those Blemishes Occur? Okay, So You Have a Blemish from One of the Usual Suspects, Now What? Well, to start you should bring your car in to the shop. We'll start with an examination of the dent and/or scratch to determine the type and severity. We then decide on the best course of action. For minor, low involvement dents we first attempt Paintless Dent Repair (PDR). 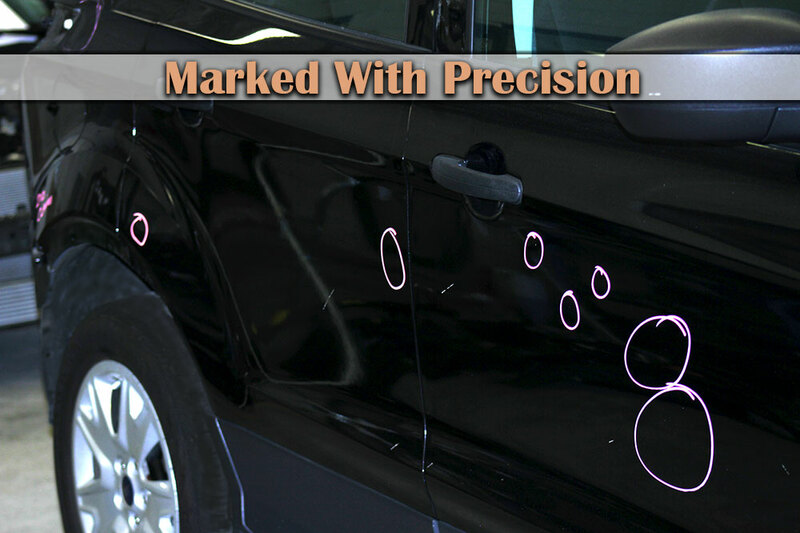 PDR is the process of removing dents and dings without removing paint from the vehicle. This can be accomplished using different soft "massage" like methods that work the dent out from either the back of the panel or from the front with non abrasive, no-impact tools. If the dent is too involved to be repaired using PDR, then we'll move forward with a more aggressive plan of action.